A distinctive feature of the occupational profile of Hispanic workers is their lack of representation in professional occupations. 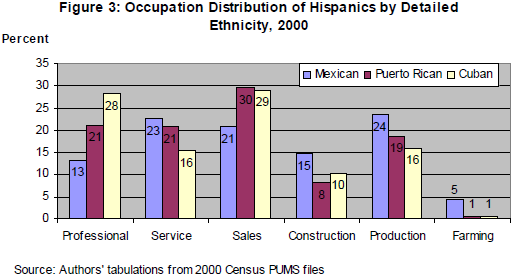 Instead, Hispanics are more likely than average to be found in construction and production occupations. This trait is particularly true of Latinos of Mexican or Puerto Rican origin. 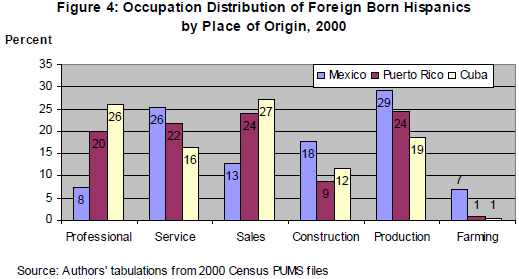 The ongoing immigration of workers from Mexico has served to reinforce these occupational characteristics during the 1990s. 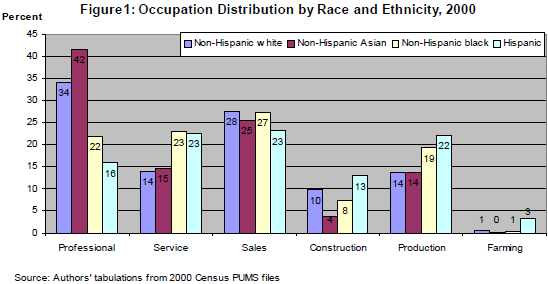 Both white and Asian workers are more than twice as likely as Latino workers to be found in professional occupations. Only 16 percent of Latinos worked in professional occupations in 2000 compared with 34 percent of white and 42 percent of Asian workers (Figure 1). In contrast, Hispanics are much more likely than white and Asian workers to be employed in farming, construction, and production occupations. Over one-third of Latino workers are employed in construction and production work. And while farming engages only 3 percent of Hispanic workers, it is particularly dependent on Latino workers as they are five to ten times more likely than other workers to participate in those occupations. In fact, while Hispanics were only 12 percent of the labor force in 2000, they made up more than 40 percent of workers in farming occupations. Overall, the occupational distribution of Latinos resembles the profile of black workers most closely with similar proportions of both to be found in professional, service, sales, and production occupations. 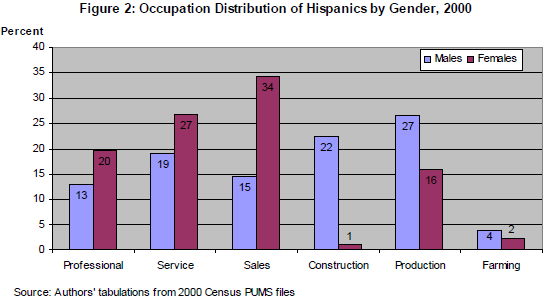 Hispanic male and female workers have very different occupational attributes. Almost half of Hispanic male workers—49 percent to be more exact—were concentrated in construction and production occupations in 2000 (Figure 2). In contrast, 61 percent of Hispanics females worked in service and sales occupations. Hispanic women are also more likely than their male counterparts to be in professional occupations. Of the three largest components of the Hispanic community—Mexicans, Puerto Ricans, and Cubans—the occupational profile of Cubans comes closest to resembling that of whites and Asians. Nearly 30 percent of Cubans worked in professional occupations in 2000 (Figure 3). On the other hand, only 13 percent of Mexicans were engaged in professional occupations and nearly twice as many, or 24 percent, were in production occupations. Mexican workers are also the most likely among Latinos to engage in construction and production work and farming occupations are almost their exclusive preserve within the Hispanic workforce.